Book #2 in The Warrens. Drawn to Josiah’s strength and the heat in his eyes, Ella enters the violence-filled warrens burdened by a secret yet buoyed by hope. In a place where loyalty is everything and the price of betrayal is death, she’s determined to make a life for herself and mother the son who is the reason for her marriage. But when Josiah takes a dangerous prisoner, the happiness that’s finally within reach is threatened by the sister whose place she took—when the warlord demanded a bride. 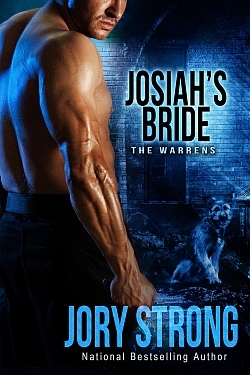 Don't want to miss Jory Strong's latest book? Sign up for Jory's book alerts below and get notified when she has a new one out. Want more? Then you can also sign up for her regular newsletter here or use the form further below. Are you interested in getting Jory Strong's latest news straight into your inbox? Then is here your chance to sign up for her newsletter. Be among the first to learn about new and upcoming books, appearances and signings as well as special promotions and giveaways! You won't be inundated with emails (she is way too busy) and Jory will never give or sell your information to anyone.